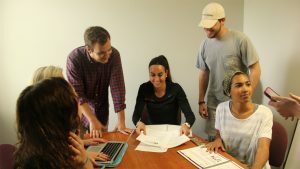 Students in the UA College of Communication and Information Sciences gather in a study room to collaborate on a project. TUSCALOOSA, Ala. — The University of Alabama’s advertising and public relations program, a department within the College of Communication and Information Sciences, has been named a top-five finalist for Outstanding Education Program in the 2017 PRWeek Awards. UA’s program has been a top-five program in seven of the nine years PRWeek has given this award. The APR program’s dedicated pursuit of excellence has led to recent, national success. Students from the APR program can boast of a 2016 Bateman Case Study Competition National Championship and a 2016 Teahan Chapter Award for Best Student-Run Firm. “Being named a finalist for Outstanding Education Program reinforces that the College of Communication and Information Sciences is an excellent place to teach, research and study,” said Dr. Mark Nelson, dean of the College of Communication and Information Sciences. The judging criteria for submissions considers each program’s faculty contributions to PR in teaching, research and service to the industry, and the program’s initiatives in connecting current and former students to the PR industry in three areas: job and internship placements, speakers and events, and consulting and experiential learning. Submitted entries for the PRWeek Awards are deliberated upon by a panel of judges including PR education professionals and senior PR professionals from agency, corporate, nonprofit and government teams. The winners will be revealed at a dinner in New York City March 16. Other finalists are American University School of Communication, DePaul University’s public relations & advertising graduate program, Georgetown University public relations & corporate communications program and Syracuse University’s Newhouse School. PRWeek provides breaking news, analysis and opinions for the public relations industry. The PRWeek Awards were launched 17 years ago to showcase and recognize the outstanding talent and innovation of practitioners in the public relations industry.